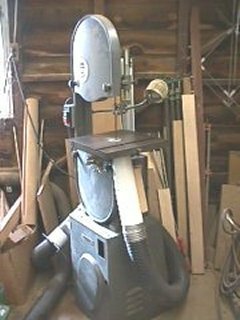 Free Bandsaw Dustcollection plans - The bandsaw can be one of the most difficult pieces of equipment to efficiently connect to your dust collection system. The connection chute on most saws, if they give you one at all, is not very good. Delta makes a great 14 bandsaw, but their chute options are poor. There are a number of shop made solutions out there that can improve dust handling. The most popular involves cutting a big hole in your lower blade guard to connect the hose. I cringed at the thought of disfiguring my saw, so I came up with this design. In the end I did do some cutting to the lower guard but in a less obvious manner.